Aldridge Hill Campsite in the heart of the New Forest is an attractive level camping site right in the centre of this National Park. At Aldridge Hill Campsite you can pitch up your tent or swing in your caravan and you're ready to experience all the beauty of living close to nature the New Forest has to offer. Whether you are a novice camper or the seasoned caravanner - the choice will be yours to enjoy! This campsite lies in a heathland clearing on the edge of Blackwater Stream. The campsite also borders Ober Water and so whilst camping here you can follow the Ober Water Trail. This photo was taken just up the track to the camping site and is a beautiful area to explore. Here's some information about the Ober Water Trails - walks you follow along the stream and so you really take in the forest atmosphere. Ober Water Yellow Trail which is one mile long. Both are lovely to explore and enjoy the forest from. 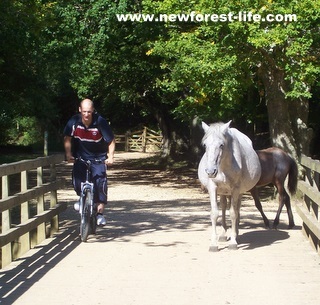 They are also excellent for disabled access to the New Forest. 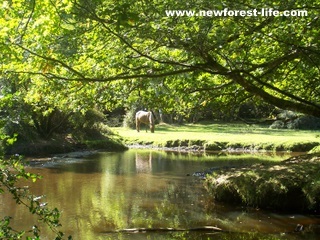 Aldridge Hill New Forest camping site is only a mile from the shops and pubs in the pretty village of Brockenhurst. Open 23 May 2019 to 3 June & 27 June to 9 September 2019. The close mid summer is due to the site being next to the New Forest Show grounds. Using Sat Nav Please be aware that there are width limits on Meerut Road (the turning before the B3055) and also from the A35 into Rhinefield Ornamental Drive on the main Lyndhurst to Bournemouth Road. Site phone number: 01590 623152. We went on a really easy and lovely cycle ride and saw this chap coming over the Ober Water just a few metres from the Aldridge Hill campsite. We set off from Blackwater Car Park and followed most of the signs but had a little detour in some places. Find out some of my suggested (and even tried!) Cycling Routes . All routes are of varying distances - it just depends on how far you wish to cycle that day. 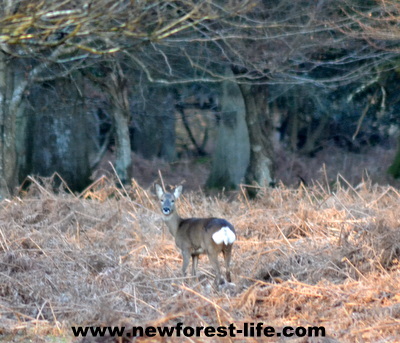 For example: put New Forest deer if you are looking to find information on New Forest deer like this lovely little deer and hit the Search button. You can subscribe and it is free. You can be assured your details will not be passed on, they will only be used, by me, to send you this monthly update on what is happening n the beautiful New Forest and some of the animal adventures that happen to me. 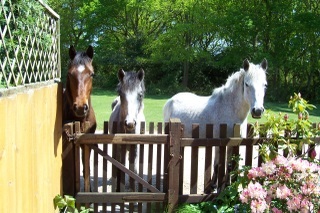 I hope you enjoy your stay at Aldridge Hill New Forest campsite. There is lots to explore and it should be a peaceful and close to nature camping area for you to discover.